Welcome to the first edition of the TMK mailbag! Got something you want us to answer next week? Send it to tmk_mailbag@usa.net. and some other things I can't remember right now. I can make more specific descriptions of the references I know of, if you decide to make a section for them. Deezer: Yes, there should! J.J. and I have been tossing around ideas for like half a year. Anything related to "real-life" Mario references will probably be thrown in a new section. We already have the Simpsons info, but feel free to send in info for anything else. Deezer: Dunno, maybe eBay.com? I doubt you'll be able to find it brand new in a store somewhere. One thing I must know. What the heck is Yoshi? Some kind of dragon, dinosaur, mutated Koopa Troopa perhaps? Deezer: Yoshi's just like Barney, in that they are both dinosaurs but it isn't obvious at first glance. However, Yoshi isn't annoying. Do you know if they sell tapes o' the Mario cartoons anywhere? Could you suggest a site with an episode guide and/or summary? Deezer: Dunno, maybe eBay.com? I doubt you'll be able to find them brand new in a store somewhere. You're welcome. Why is that Koopaling named Morton Koopa Jr.? Who is Morton Koopa Sr.? Wendy O. Koopa = Wendy O. Williams, late lead singer of the Plasmatics, a popular band in the late '70's and early '80's. Lemmy Koopa = This is a stretch, but in Japanese, sometimes N's are pronounced like M's. "Lenny" is short for Leonard, and Leonard Cohen is the first musician that comes to mind. As Dennis Miller would say, "That's just my opinion; I could be wrong." 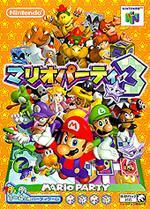 Is it possible in the Mario Gamecube game, that the three hats from Mario 64 will return? Also, why wasn't a Fire Flower, or Super Star, didn't make an appearance in Mario 64? Deezer: Anything's possible with Miyamoto running the show. To answer your second question, see my first answer. :P Though I thought the Vanish Cap was pretty neat, I would've rather seen the classic Mushrooms, Flowers, and Stars than the caps. I haven't seen any pictures of Waluigi or Daisy. You sure about the appearance thing? And I think Mouser and Tatanga should be brought back while Nintendo's still bringing back old characters,eh? Deezer: Yes (check the Japanese Mario Party 3 box art that I added after you sent this letter). And I agree with you about Tatanga, but Mouser can get exterminated for all I care. Mouser was originally a Doki Doki Panic creation, and I have no compassion for the characters in SMB2 (USA) -- unless they reappeared as cute little Yoshi fodder in SMW2: Yoshi's Island. In Booster Tower of Super Mario RPG, there is a block that seems to be pointless. It's located in the room where Booster tosses bombs down at you. The block over the door...do you have any idea what it does? Deezer: You are the first one, silly! And no, not off the top of my head. My friends talk about a SNES game called Super Mario. Not Super Mario World, SMRPG, SMB or anything like that just plain Super Mario. Deezer: I think either they are referring to "Super Mario World," or they have eaten too many "Magic Mushrooms." where did u get the idea for wtmk? Deezer: David Dayton suggested it, and he was inspired by NDORK Radio over at Nintendorks.com. And I think we're ripping them off again with this new "Weekly Reader Comments" feature.